6.1 Is there a Perfect Diet for Psoriasis Sufferers? 7.1 Is there a Perfect Diet for Psoriasis Sufferers? There are many treatments for psoriasis both those that are effective and those that are not and one of the best psoriasis treatments involves implementing a psoriasis diet. Making changes to your diet will not only improve your health but also works as an effective way to control psoriasis. While a psoriasis “cure” does not exist per se, there are definitely many ways that can help you deal with current psoriasis flare-ups or eliminate the occurrence of flare-ups or keep them to a minimum without resorting to drugs which may come with their own side effects. Knowing what causes psoriasis begins with the understanding that this is a chronic skin condition with no known cure at the present time. There continues to be continuing research into what causes psoriasis since doctors have no idea what causes psoriasis. Doctors and research has shown that it tends to run in families with a family history of the condition however one may develop this condition even in the absence of a family history. In addition, simply having a family history does not automatically mean that that one will develop the disease. This disease continues to remain a mystery in term of what causes psoriasis and why the immune system then functions abnormally leading to the skin regeneration occurring more frequently than normal in someone with psoriasis. Normal skin regeneration when old skin cells are discarded making way for new skin cells, takes place in about 30 days. With psoriasis, this process takes place in a matter of a few days leading to dry, round, scaly patches of that are silvery, gray or white in colour in most cases of psoriasis. A few other cases of psoriasis produce smooth reddish skin, pus filled bumps, etc. Psoriasis flare-ups can be triggered by a variety of reasons such as stress, a skin injury, certain infections especially bacterial infections, certain drugs, surgery, etc. Various herbalists also believe that flare-ups can be caused by having a toxic liver or anxiety. Today’s agricultural practices are not what they used to be which means that our foods are not as nutritious as they could be and our bodies in addition to our skins bear the brunt of this change in the way food is produced. If you suffer from skin conditions including psoriasis, this makes it doubly important to follow a proper diet. Our bodies are also filled with toxins from various sources such as the environment in addition to the food we consume. In order to rid our bodies of these toxins, it is better to do this through urine and not through our skin especially if you have psoriasis and a proper psoriasis diet will help you get rid of toxins naturally. Getting a psoriasis diagnosis means that one of the effective measures you need to adopt is to adopt a psoriasis diet immediately which will help you control or eliminate flare-ups. The first step with a psoriasis diet is to eliminate or significantly reduce processed foods. Include more whole foods such as whole grains in your diet. Look for organic foods which do not contain pesticides. These whole foods will help your body greatly with the process of elimination since they contain a lot of fibre and they also contain various nutrients that are not only good for the body but also good for the skin. A diet that is rich in vitamins A, B, C, D, E, and zinc comprises an effective psoriasis diet. For sulphur content, consuming garlic and onions is beneficial. Keeping sodium consumption to a minimum is important for psoriasis. Sodium contains dehydrating properties and one of the main ways to fight psoriasis is to keep the skin properly hydrated. Dry skin will only lead to psoriasis flare-ups. Include good fats in your body while eliminating bad fats such as saturated fats and trans fats is important on a psoriasis diet. Good fats include omega 3 and omega 6 fatty acids commonly found in certain fish such as salmon or tuna, certain nuts, oils such as olive oil or canola oil, etc. Fatty acids are great to reduce inflammation. Supplements containing these fatty acids may also be added to a psoriasis diet if you have difficulty included the actual foods on the psoriasis diet. Other supplements such as those containing evening primrose oil, borage oil, etc are also great for a psoriasis diet. Changing what you eat can make all the difference in the world, especially if you have psoriasis. The body is poisoned daily, and filled with toxins from the air we breathe and the food we eat. The best way to remove these toxins is through the urine and not through the skin; this is especially vital for sufferers of psoriasis. If you have been diagnosed with psoriasis, it is best to change your eating habits as soon as possible to help alleviate the symptoms and control the outbreaks. Eating whole foods as opposed to processed foods is a excellent way to start. You will want to keep the toxins in the system to a minimum, and this can be done by eating organic produce instead of produce grown using pesticides. If organic food is out of your reach, make sure to at least wash off fruits and vegetables well to remove all traces of any chemicals. Raw is the best way to consume vegetables, and not only because they lose some of their nutrients when cooked. Raw vegetables are also higher in fibre and are simple for the digestive system to process. Some foods that are simple for the digestive system to process are beans, seafood, nuts, green, leafy vegetables, and fresh fruit. The more fruit and vegetables that are in your diet the less likely you are to develop allergies, which are related to the causes of psoriasis. Fats are normally not fantastic for your body and we are encouraged to reduce them where possible, but the body does need a small amount of fatty acids to properly function. Fatty acids also play a vital part in eliminating and reducing inflammation. Some of the best fatty acids you can add to the diet are cold water fish, flaxseed, and green leafy vegetables. High sodium food is not excellent for you either, and it can leave your body very dehydrated. As for salt, things aren’t so black and white. Not all salt is made equal. Switching out your refined salt and replacing with sea salt is a more natural, healthy choice. Natural sea salt will raise your energy levels, help relieve the symptoms of allergies and rashes, protect against radiation, balance the acid in the body, give you vital minerals, add resistance to infection, and replace lost electrolytes. By making a just few simple changes to what you eat, you can help the body to take steps to naturally heal itself and stay healthier. If you reckon of psoriasis as your body’s way of telling you something is out of balance in your diet and lifestyle, just taking notice and doing something about the problem could make a world of difference. If you suffer from the effects of Psoriasis you’ll have been told that it’s a hereditary condition and that there is very little you can do to lessen its effects other than keep applying the creams and/or take the steroids. But what if you want to be more pro-active about your condition and try to help yourself? Many of you have seen the effects of Psoriasis on your parents or grandparents worsen as they age and would like to try to stop, or at least lessen its effects before it gets that bad. There is increasing evidence that obesity and lack of exercise are greatly adding to the numbers of people suffering from the effects of Psoriasis and its severity. Diet Studies have shown that for many sufferers a gluten free diet can help to control the condition. Because Psoriasis is triggered by a problem in the immune system those people who have intolerance to the starches found in products such as wheat, grasses and rice can find this aggravates their condition. Dairy products are also a common source of problems. Most dairy products we consume are made from cow’s milk which of course has been designed by nature as a whole food for a developing calf and not a Human digestive system. Gluten and Dairy products are the 2 major sources of food allergies in the population today and although they’re not a cause of Psoriasis in themselves you may be allergic to either of them without knowing. A doctor or dietician can help you to find out. Increase your intake of fruit and vegetables known to have beneficial properties for the skin. Fruits such as Apples, Oranges, Melon and Avocado are known to be very good for general skin health as are Berries such as Raspberries, Strawberries and Blueberries. Vegetables which are known to improve skin health include Cucumber and Celery, both of which are excellent diuretics and will help to reduce fluid retention whilst Ginger has excellent antibiotic qualities. Drink plenty of fresh water and keep the intake of coffee, sodas and especially alcohol to a minimum. Try to cut out highly processed foods which will contain high levels of sugars and salt, and replace them with lean meat and oily fish which is high in omega 3. In addition to improving your general health these dietary changes will lead to steady, controlled, and permanent weight loss which won’t only help to reduce the severity of your Psoriasis but should help you to feel better about yourself in general. Stress and depression are recognized contributors to both the onset and development of Psoriasis. Light therapy is often used in the treatment of Psoriasis and as we all know there is a regular, free, source just outside our window. Perhaps you can use the car less or just walk around the block once a day, but let the air and light get to your skin as much as possible. By changing your lifestyle you can move from a downward to an upward spiral of health and self confidence. Losing weight, reducing the severity of your Psoriasis and eating healthier foods will all help to make you feel better about yourself and help you to feel that you’re taking a more active part in the control of your condition. While you can find one or two different medical remedies and treatments which are available for psoriasis vulgaris, lots of people are interested in finding a more everlasting and natural manner to handle the problem and decrease the psoriasis symptoms. Probably the most typical and widely used methods by which people could help to relieve the affects of psoriasis would be by making alterations in the eating habits. The primary detail to keep in mind when you’re going to start a “diet for psoriasis” would be that each person’s experience is going to be individual. What work for some will not have exactly the same affect on another? Experimenting and trying out different things is essential if you wish to figure out what is beneficial for you as an individual. A food journal is normally an efficient way of noticing alterations in diet and whether specific foods are aggravating or alleviating some of the psoriasis symptoms. The main changes that should take place when you are making dietary alterations to beat psoriasis are to avoid starch rich foods, and also food that is very acidic. Sugary foods, caffeine and alcohol are all substances that can create more symptoms or aggravate existing ones. Consuming at a whole lot of pure water every day will always do some good. Healthy fibre and water will help your digestive system which yet again will do wonders for your psoriasis symptoms and condition as such. Digestion is Alfa and omega when it comes to psoriasis and other skin problems. There are some categories of foods which are well known to be efficient against psoriasis symptoms for all people. Foods that are rich in Omega 3 fatty acids are very beneficial for the skin and help to keep it strong and vigorous in all respects, including helping to alleviate psoriasis symptoms dramatically. You can find omega 3 acids in many different types of fish, and also in seeds. You can also buy omega 3 supplements that are very affordable and efficient. All foods that the body finds challenging to digest, for example eggs, butter and red meat should be avoided as much as possible. Certain dairy products and red meat contain a substance named ‘arachadonic acid’ that works as a natural inflammatory. Any of the foods mentioned above ought to simply be avoided if you do not wish to further aggravate your digestive tract and skin. Along with these products, processed meals which can be hard to break down in the body must also be avoided as much as possible in order to decrease the symptoms of the condition. Always consider that this is a trial and error method. You will make some mistakes along the way, but the important thing is not to give up half way. Use a diet journal to keep track of your experiment, and don’t give up until you see the outcome you are looking for. People must be aware of the fact that a breakthrough discovery have been made when it comes to treating and curing psoriasis vulgaris. This breakthrough remedy has already helped hundreds of people to become permanently healed from their disorder by taking care of the root cause. Psoriasis and diet is an important ingredient of this treatment, but it’s really only half the story. Psoriasis is an auto-immune disease. People with Psoriasis can detect lesions on the skin, caused by a deregulation on skin cell proliferation: usually, it takes 1 month for complete skin cell renovation. In psoriasis, the skin cells proliferate fully after only approximately 2 weeks, causing the red-coloured lesions. First of all, you should avoid excessive consumption of alcohol, which is one of the main trigger factors of psoriasis. General condiments are also great enemies for people trying to relief psoriasis, and you should avoid especially the ones containing pepper, pimento, cinnamon, curry, vinegar, commercial mayonnaise, ketchup and paprika. Red meat and dairy condiments should be avoided too or eaten in moderation. Some studies indicate that these foods contain a special type of acid, called arachadonic acid, which is believed to cause inflammations that worsen psoriasis lesions. So, avoid animal fats, sausages, pates, eggs, processed cane foods, chocolate-based products, spice cakes and nut-based pastries. In the other side of the coin, there are a lot of foods that you can eat and take advantage of its substances to treat psoriasis gradually. Several studies show that diet is a very important factor in the treatment of psoriasis. In general, what you have to do is take a more natural and healthy lifestyle in your diet. Researchers recommend the ingestion of antioxidants, low animal protein, fresh fruits and vegetables, foods rich in copper and zinc, omega-3 fatty acids and beta-carotene. Oily fishes are recommended a lot, because all of them contain omega-3 fatty acid (EPA), which seems to be converted into anti-inflammatory substances such as leucotrienes 3 and 5, which prevent the appearance of psoriasis symptoms. Good suggestions of oily fishes are sardines, salmon, trout and mackerel, for example. You can also ingest omega-3 by other sources, such as flax seeds, mangoes, tuna carrots, apricots and green leafy vegetables. A fibre-rich diet is also very important in the management of psoriasis, since a low fibre diet was associated many times with toxins affecting the gastrointestinal tract. These are the most important things that you can add in your diet and which usually people don’t give the necessary attention. After this, it’s strongly recommended that you ingest breakfast cereals and breads (especially those enriched with folic acid), sources of selenium such as Brazil nuts, cabbage, broccoli and Brussels sprouts and shellfish. Psoriasis is a chronic skin disorder that can make sufferers absolutely miserable. Whether the outbreaks are mild or severe, people just want the condition to pass and never return. Unfortunately, there is no cure for psoriasis. There are a few things you can do to prevent a psoriatic outbreak and controlling your diet may be one of them. At the present moment latest research suggests that there is some connection between psoriasis and diet. However, the connection is not well researched or understood. There is, though, lots of evidence supporting the idea that what you eat can have an effect on the skin disorder. 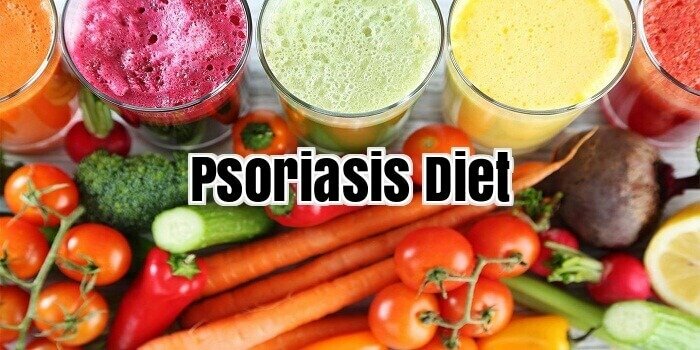 Is there a Perfect Diet for Psoriasis Sufferers? Do a cursory search on the Internet and you will be inundated with web pages proclaiming they have the perfect psoriasis diet plan. The problem is that the information on these sites conflict with each other. One site will recommend drinking lots of tea while another site will tell you that tea is the enemy. The main issue is that everyone’s physiology is different. What may work for someone may not work for you. To help you find your perfect anti-psoriasis diet, it is a good idea to keep a food and symptom journal. Log what you eat on a daily basis and make note of your symptoms. If you notice that you experience an acute psoriatic outbreak after eating certain foods, then chances are good that food is a trigger. Likewise, if your psoriasis seems to improve after consuming other foods, then you may want to keep them in your diet. In general, the best diet is one that supports the body. Psoriasis is thought to be an autoimmune system disorder. A healthy diet supports and encourages proper immune system functioning among other things. A good diet consists of lots of fresh fruits and vegetables, whole grains, and lean cuts of meat. If you are not sure how to create a well-rounded diet, the USDA Food Pyramid is a good place to start. A registered dietician with experience treating a patient with psoriasis can also provide assistance. The foods to avoid are those that contain a lot of fat and sugar, but that don’t have any nutritional value. This would include potato chips, candy bars, ice cream and similar empty calorie foods. Over consuming these types of foods can cause other health complications like insulin resistance to develop. There is a hypothesis floating around that the people with psoriasis also have gluten intolerance, and that consuming gluten can trigger psoriatic outbreaks in addition to Celiac disease. According to the research, people with psoriasis have anti-gliadin antibodies that react negatively to the presence of gluten in the body. If you suspect you have gluten intolerance, then it may be a good idea to follow a gluten-free diet for a few weeks. In this diet, all you do is avoid foods that contain gluten such as products made from wheat, rye, or barley. Don’t be afraid to stick with the diet if you notice an improvement in your psoriasis. It can take awhile for your body to adjust to a new diet. In the meantime, you will want to use an over-the-counter product to help you manage your psoriasis outbreaks and symptoms. Whether you have scalp psoriasis or guttate psoriasis on your body, we have reviewed several home remedies you can use to get relief fast.